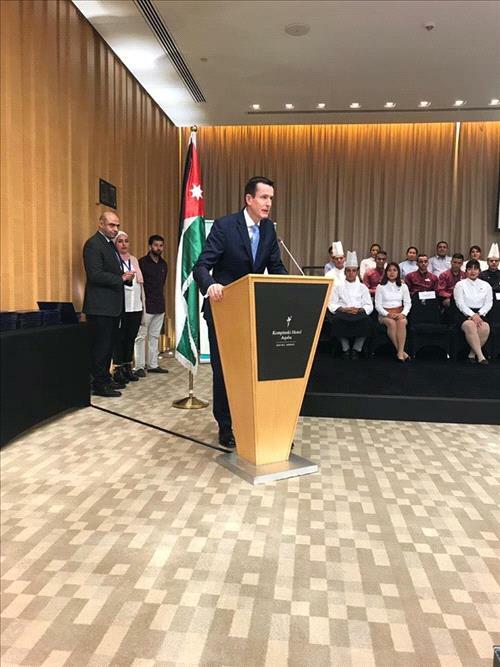 AMMONNEWS - Mövenpick Hotels & Resorts, Jordan graduated 70 employees from the Pathways to Professionalism Developmental Programme, a tourism project for building economic sustainability in Jordan funded by USAID. The programme and its graduation ceremony were held in Aqaba on January 29, 2019. It focused on building and maintaining the capacities of participants, to enhance and develop their knowledge, professionalism and individual attribution within a team and an organisation. Mövenpick Hotels & Resorts Jordan's contribution in this programme stems from its belief in the importance of professional development through coaching employees to gain new experiences and skills. Achieving these outcomes will in return have a positive impact on the tourism and service sectors that will elevate their level of services with efficiency. "We are proud to see our employees participating in this specialized programme, as we focus on the importance of continuing to nurture professional development. It is our duty to continue motivating employees helping them achieve their goals and ambitions, the programme will lead to enhance and develop their careers," said Mr. Michael Nugent, Accor Hotels Vice President, Operations, Levant and Pakistan.